If anyone doubts Alice Temperley’s ability to show a world class catwalk collection in London, then they must look no further than the uber glamour and starry affair staged at The British Museum and one of London Fashion Week’s highlight points. 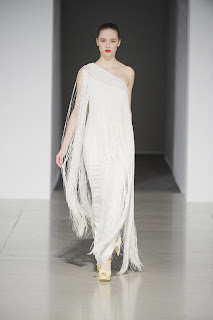 Temperley London has ‘femmed’ up to the nines and sent modernist, moll-like, turbaned Gloria Swansons down the voluminous catwalk area in drape satins, embroidered net, beaded French lace, organza and slick, fluid jersey. And boy was it Hollywood worthy. These were outfits jet set for red carpets and the international fashion circuit’s playground of The Hamptons, Hollywood, Monte Carlo and Portofino rather than Ms Temperley’s bourgeoisie backyard of Notting le Hill. 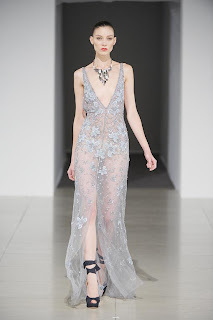 A play on transparencies combined with a supremely feminine silhouette that was both elongated and body conscious. 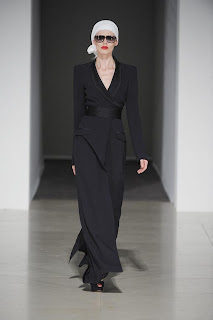 Soft tuxedo looks were given a twist, with tailored satins that sat alongside crystal encrusted gowns, creating a synergy between both day and evening and giving the collection a highlighted focus on luxury. Draped kimono capes in over sized floral prints and fine form-hugging knitwear detailed with golden crystal droplets sparkled while delicate fringed cocktail dresses and transparent slip dresses in panelled French lace and chiffon displayed classic Temperley details and craftsmanship. 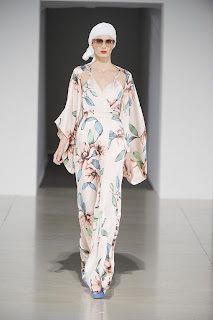 Temperley didn’t veer from her recognisably Temperley colour palette of creams, soft nudes, pistachio and lemon shot through with graphic navy and white but the large florals were fresh and added panache and humour. Go ask Alice how to do celebrity. Temperley scored the ‘celebs of the week’ with front row, Pippa Middleton, Jacquetta Wheeler, Laura Bailey, Rosario Dawson and Peaches Geldof, all of whom gave off the sheeny edge of wealth and priviledge…yes, even Peaches Geldof, vampish in red satin. Temperley London has stepped up to the mark. Her New York edge is plain to see and has paid off but London is all the better for having her show back on home ground. To make a comment on this review, please leave a comment in the box below. Thank you. the clothes are very dashing. i admire how it looks and how the model carry the clothes. love it!